qps is the graphical task manager included with Lubuntu. Lubuntu ships with version 1.10.20 of qps. To see your memory usage in qps look at the bar that says MEM. The bar for CPU usage shows CPU usage with a bar graph with usage with a bar graph for cpu usage. The Uptime in the top bar shows how long your computer has been running. A blue bar showing file input output shows graph in blue. Above this there is a green graph that shows your CPU useage as a graph. To show when a program was started with the START column. To have a view of process ID of each process use the PID column. The column Command Line shows what command line starts the process. To show which user the process is running on is in the USER column. To sort your processes by memory click on the mem tab. To have your processes sorted by CPU percentage press the button CPU% To have your processes sorted by CPU%. To sort by the command line of each process you can press the command line. To sort by how much memory is used by each process click on the Mem tab. To change your process view to each process gets its own line or linear select the Linear radio button in the upper left hand corner. To oranize each related process with a tree for parent and child processes press the Tree radio button. To search for a particular process enter a search term in the bar towards the ceneter top of the user interface. To change the update period is to Option ‣ Update Period. To change more prefrences Option ‣ Prefrences and a prefrences window will pop up. To change the font is the drop down menu under Appearance and the drop down number is for the font size. To change how cpu usage is divided per your total number of CPU cores or a Single cpu press a radio button under %CPU divided by. 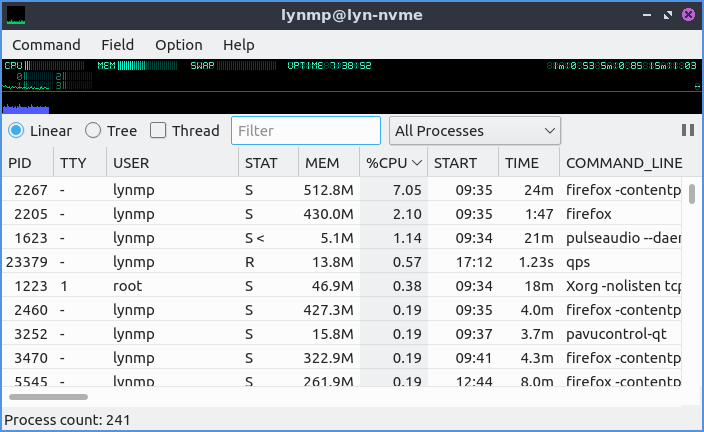 When you have qps open a tray icon will appear that shows a graph of cpu usage. To search for a particular process you can type your type into the search bar right above a particular process right above it. To terminate a process right click on it and select Terminate or press delete. To kill a process move the mouse over it right click and select Kill or press Alt + K.
To toggle showing a graph with your overall system usage check/uncheck the Otion ‣ Show Graph checkbox in the menu. To toggle showing the bar with the option to search for processor or choose linear or tree view of processes check/uncheck Option ‣ Show Control bar checkbox in the menu.